Totowa has a population of 10,000 but over 84,000 buried in it’s cemeteries. Laurie Giordano, son the famous electrician buried at Laurel grove cemetery, is currently working on a photographic memoir, “The Totowa Book of the Dead.” Although it will be about the cemeteries in part, it’s about life growing up in Totowa. Excerpts and pictures can be found at the website listed above. I look forward to it. I like the B&W photos she is using, since B&W is so much more moody and expressive then color…. 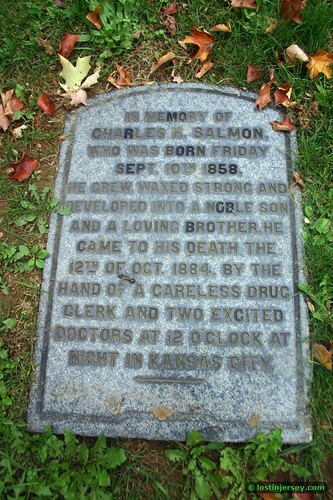 I heard about this cemetery called Skunk Hollow in the Palisades Interstate Park area. I contacted the director and this is what he told me. Skunk Hollow was considerably north of Zabriski, in the area northwest of State Line Lookout. If you go on the ski trails there you can find some old stone walls and such from the settlement. There are also a few old cellar holes, very small, if you poke around a bit. The cemetery, which is unmarked/unmapped, is apparently in Norwood, down in the valley, and not in the park. A small grave site is in the park, but if you weren’t looking for it, you’d go right by it: it has two stones, both of them unmarked and overturned, nothing more (it’s off the trails, and I doubt I could find it again even if I were looking for it). The Parkway goes right through the center of the Skunk Hollow site, and I’m guessing a good portion of its ruins etc. are under the pavement. For more info: there’s an historic marker on Rt. 9W at the state line proper, just north of the Lamont entrance; there’s a booklet published by Bergen Co. Historical Society called “Jack Was Earnest” by Reginald McMahan, available at many local libraries; a woman named Joan Geismar did a dissertation on Skunk Hollow that was later published as a book, though I don’t have the publishing info on it offhand (I have a copy of the original dissertation). The Skunk Hollow church moved to Sparkill, NY, and is still in existence and active (I believe there’s a marker in front of the church as well, but I’m not sure).